The 50 pound HD™ standard head has been redesigned with reinforced parts and a 5-year manufacturers warranty! 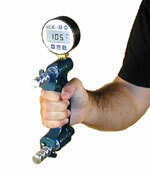 The Baseline® hydraulic pinch gauge uses a hydraulic system to assure convenience, produce reliability and measurement accuracy and repeatability. The therapist can support the pinch gauge during testing. This yields a more accurate result for all pinch tests, including tip, key and palmer. 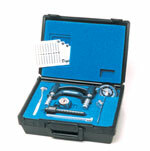 Baseline® pinch gauges have been manufactured in the USA since 1978. The results are consistent with published Baseline® and Jamar® studies. Maximum reading remains until the unit is reset. The strength reading can be viewed as either pounds or kilograms.